The Food Alphabet and More: Waffle all-you-can and more at KFC's a.m. Waffle Buffet! You can choose to enjoy your waffles in unlimited ways – one is by creating your own combo with KFC’s wide variety of toppings like marshmallows, crushed brownies and oreos, and peanuts. Finish off your creation with your choice of maple syrup, chocolate syrup, whipped cream, mango sauce or strawberry pulp. You can also pair KFC’s warm waffles with unlimited servings of garlic rice, scrambled egg, chicken tocino, Original Recipe chicken fillet w/ a.m. steak sauce and chicken ‘n cheese dog. All these goodness are available for only P199. For kids between 3 to 4 feet will only pay P99 while kids below 3 feet are already free. You can add P30 if you prefer to have unlimited orange juice, apple juice, coffee or hot chocolate in the morning. 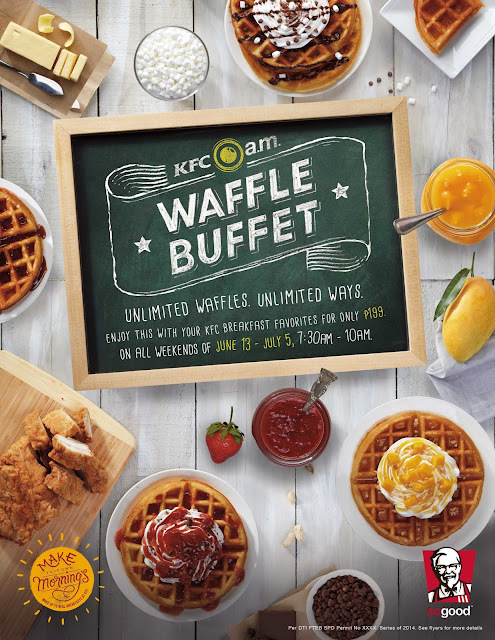 The new KFC A.M. Waffle Buffet will be available for all weekends of June 13 to July 05 from 7:30 – 10:00 AM. Since store seats are limited, the earlier you buy your ticket, the better! Just visit one of the participating KFC breakfast store to purchase your ticket ahead. What are you waiting for? Time to get up early every weekend morning and enjoy the newest KFC A.M. Waffle Buffet with your family and friends. Visit any of the following participating KFC breakfast stores below to enjoy the buffet! Visit the following KFC branches to enjoy! For more information on the KFC A.M. Waffle Buffet, you may visit bit.ly/KFCWaffleBuffet.